It’s so hard to get new donors to pay attention. We can’t seem to reach younger donors. Our Facebook engagement is way down – no one sees our posts! Cutting through the clutter seems impossible, especially on social media. Nonprofits can’t actually raise money on social media, can they? More often than not, as a solution to these very common nonprofit problems, I recommend checking out some of the more popular social media fundraising tools available. Namely Facebook Fundraising tools, including Facebook Fundraisers, and the newly released suite of YouTube Giving tools. The reaction from nonprofit professionals is often one of shock, disgust, and/or disbelief. But they don’t give you the email addresses of the people who donate. What good is it then? At this point, I like to present them with a photo of a poster that I took in my daughter’s 4th grade classroom. It depicts a GROWTH MINDSET over a FIXED MINDSET. Last year on #GivingTuesday, 473,000 donors gave to nonprofits via Facebook fundraising tools, and THREE-QUARTERS of these donors had not previously donated via Facebook. Want to reach younger donors? YouTube is the most popular social media channel with the younger crowd, with 94% of American 18- to 24-year-olds watching videos on the site. We know that Facebook is trying to reshape its image. Facebook itself said that it is going to elevate and promote posts that “spark conversations and meaningful interactions between people” – enter more fundraising! Want to cut through the noise? When a potential donor goes to your website and clicks on the Donate now button, but doesn’t complete the donation, what happens? My bet is that nothing happens. Most nonprofit websites aren’t set up to optimize conversions in this way. On Facebook, they send a notification REMINDING the person to finish the donation. Facebook also promotes any and all fundraising initiatives that they think you may be interested in – from friends, from family members, from colleagues, and from causes that you care about. Want to actually use social media to raise money? Google/YouTube and Facebook designed these tools to make it easier for their users to contribute to the causes that they care about. They also created them to make it easier for people to start their own fundraising campaigns, and connect their passions with others on the site. Yes, these social media platforms are businesses. But that means that they have a big incentive to see their shiny new features SUCCEED. They want people to adopt them – to donate, to share, to start their own campaigns. What we need to come to terms with is that the nonprofit is no longer in control of the fundraising medium. It’s no longer about the nonprofit’s agenda. It is entirely user-facing, user-first. It’s impossible to drive donations on these sites. However, now that Facebook and YouTube are providing the tools to get donations, actively encouraging their BILLIONS of users to adopt them, and not taking even a tiny percentage via fees, nonprofits are complaining because these tools aren’t perfect! Like anything else, perfect is the enemy of the DONE. Facebook Fundraising tools, and the newly announced YouTube Giving suite of tools, are going to disrupt traditional fundraising methods and the entire nonprofit ecosystem. Let me be clear – I don’t think that social media fundraising will REPLACE the old, tried-and-true ways of raising money. But I do have news for you. Giving money on social media is already happening. It’s not a future trend. It’s reality. And it’s here to stay (for the foreseeable future at least). You can stand there and curse the sky, or you can figure out how to best embrace these tools to benefit your supporters and your mission. 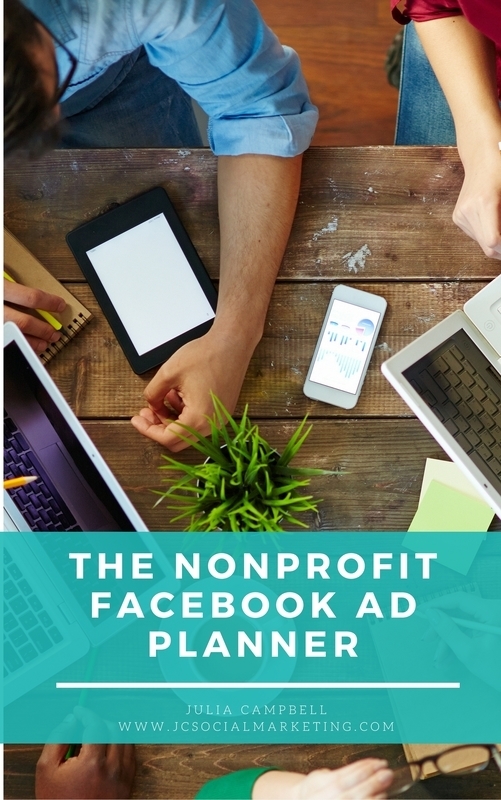 The Nonprofit Facebook Ad Planner is designed as a simple guide to help you plan, create, launch, and measure a wildly successful Facebook Ad campaign to achieve your nonprofit’s objective, whether it be raising awareness or raising money. Another great piece with valuable information we can use right away. Thank you!